G-FORCE Racing Gear UNIVERSAL - Lesher Motorsports, Inc. 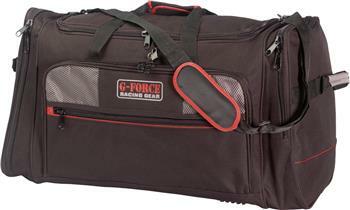 The G-FORCE Racing Gear Helmet Bag is made from a bright durable nylon shell and an inner liner of specially formulated double knit fleece. The bag protects the face shield and helmet shell against scratches and dings. The outer layer also has spacious pockets for a safe place to store personal belongings. The G-FORCE Pro Helmet Bag features Luxurious Soft Fleece Liner, Double Adjustable Zippper, Interior Net Cargo Pocket, Strap Handle, Pull Tabs on Zippers, 4 Vents, Semi Rigid Construction & Rubber Feet. Store all of your racing gear! Great for your helmet, suit, shoes, gloves, Nomex underwear, and more! Super bag with built-in wet storage is perfect for boots or dirty clothes. Expandable side pocket for gloves and two front pockets for tear offs, log books, rule books, and more. 8 Separate Compartments, Adjustable Shoulder Straps, Hand Held Device Pocket!